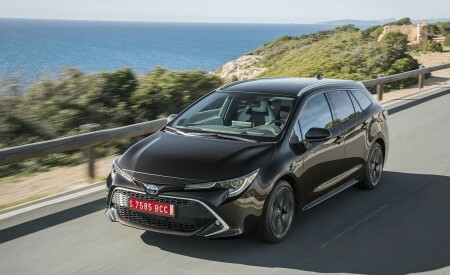 The Yaris sedan, previously the Yaris iA, will be offered in three grades for 2019, including the sporty L, the well-equipped LE grade, and the new premium XLE grade. Premium, on a Yaris? That’s right. 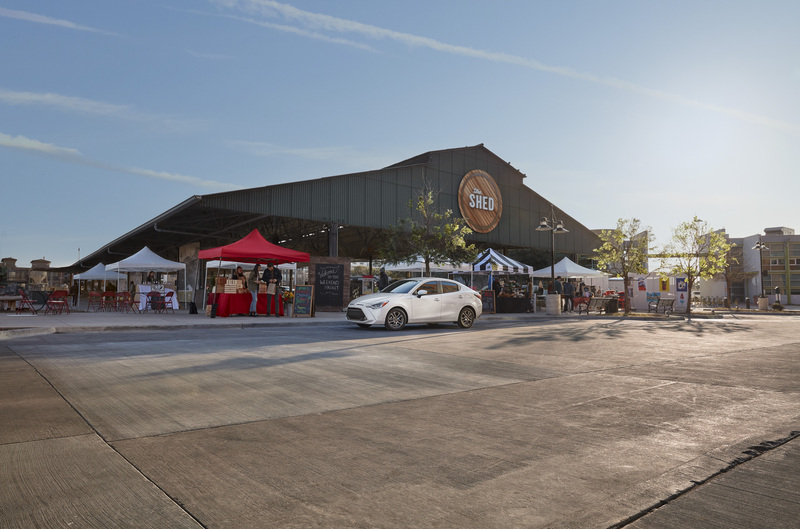 The XLE takes Yaris up a notch with sporty leatherette-trimmed front seats, leather-trimmed steering wheel, shift knob and parking brake, an HVAC system with Automatic Climate Control, automatic LED headlights, rain-sensing wipers and illuminated entry. 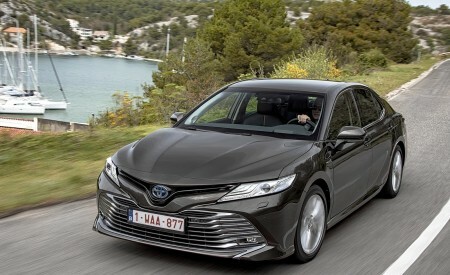 For 2019, all Yaris sedans will feature a new sport-inspired front grille with a honeycomb insert design. 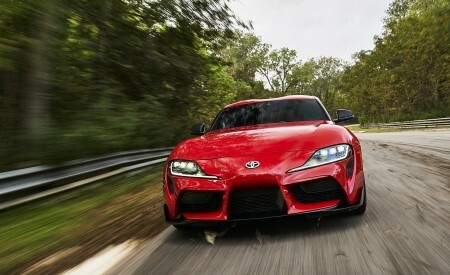 Exterior styling cues include upscale piano black accents and chrome trim. Fog lights come standard on the LE and XLE grades, and these grades also sport a new rear lip spoiler. Every grade is fitted with a roof-mounted, color-keyed shark fin antenna for available satellite radio. Power outside mirrors come standard on the L, while the LE and XLE are equipped with power outside heated mirrors with LED turn-signal indicators. 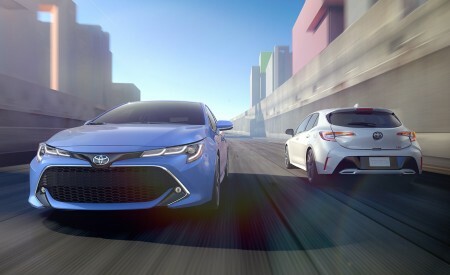 Safety is a priority on every Toyota, and that’s why all Yaris sedans comes standard with an Active Safety System and Low-Speed Pre-Collision System. 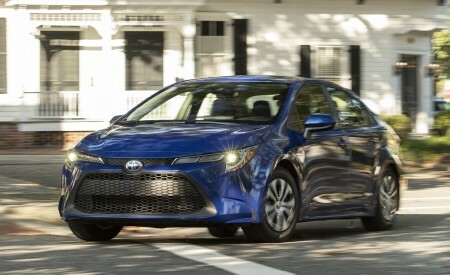 The Yaris features a high-compression 1.5-liter engine that boasts up to 40 miles per gallon (MPG) on the highway*. The Yaris sedan will be offered in seven colors that include Frost, Chromium, Graphite, Stealth, Sapphire, Pulse and the all-new Icicle. The new Yaris will go on sale in the fall of 2018. There’s no question that fuel economy is high atop the list of must-haves for Yaris. 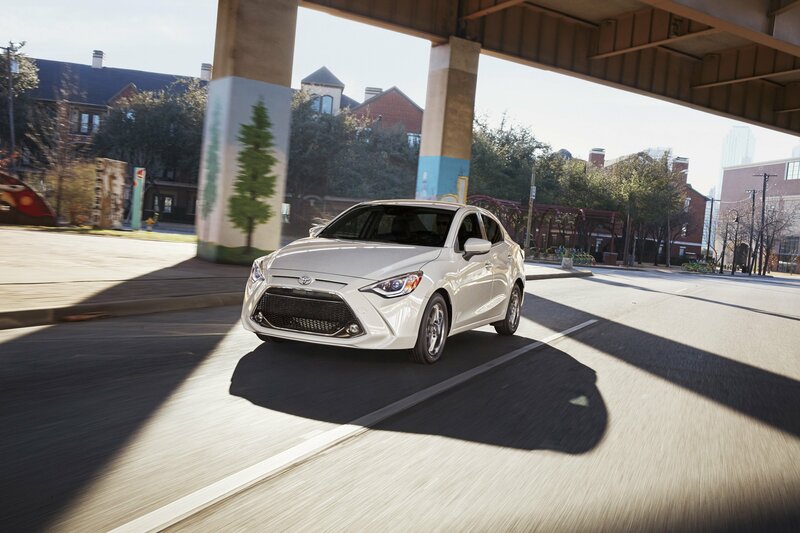 When the direct-injection 1.5-liter engine is paired with the available 6-speed automatic transmission, the Yaris boasts an impressive 32 MPG in the city, 40 on the highway and 35 combined*. 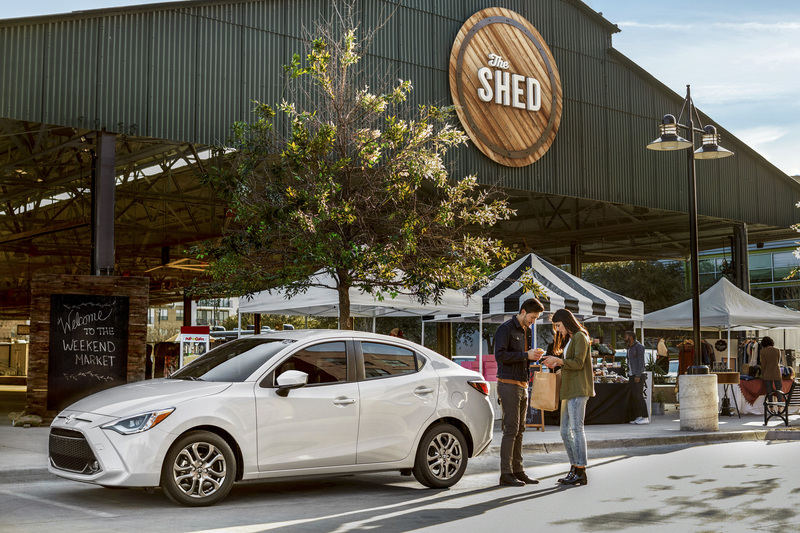 When paired with the six-speed manual gearbox offering, the Yaris provides 30 mpg in the city, 39 on the highway and 34 combined*. 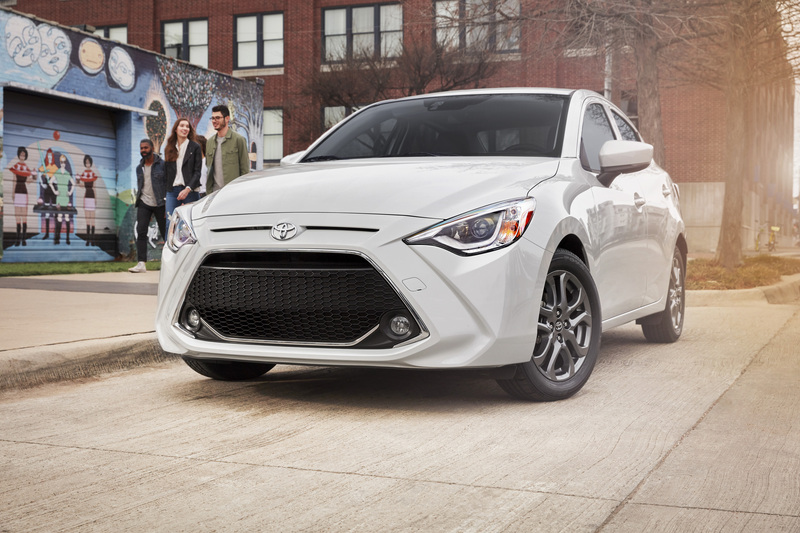 The sporty Yaris sedan is a blast to drive, thanks in large part to the engine and transmission offerings. 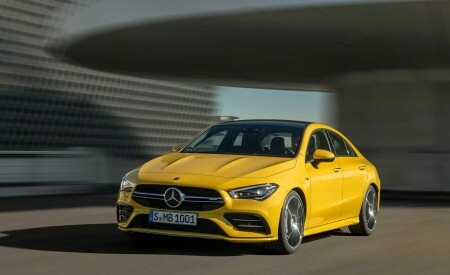 The 1.5-liter DOHC four-cylinder engine pumps out 106 horsepower and 103 lb.-ft. of torque for plenty of pep to power onto highway onramps and seamlessly navigate workday traffic. 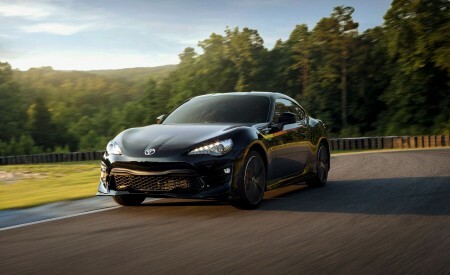 The standard manual transmission features a compact, lightweight design with a short-throw shift for smooth, quick gear changes. 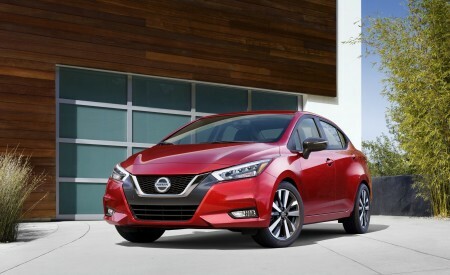 The available automatic transmission aids in smooth starts while offering quick, precise shifts at higher speeds. 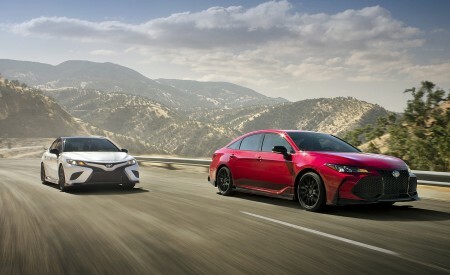 Yaris’ sporty handling is engineered into the chassis with effective use of high-tensile steel in the body and frame. 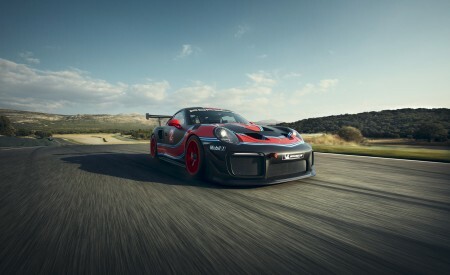 The rigid chassis design is complemented with a pairing of stiff springs and MacPherson struts on the front suspension and a durable torsion beam suspension in the rear. The electronic power steering is designed for smooth, effortless operation. 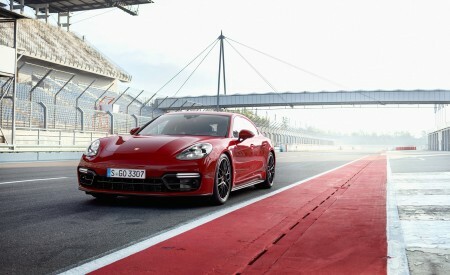 For more spirited driving, Sport Mode provides improved torque feel at the flip of a switch. Stopping duties are handled by ventilated discs up front and drum brakes in the rear. The braking system is tuned with a progressive experience when cornering, as the pedal offers a cushioned feel that gets progressively more rigid as G-force rises. 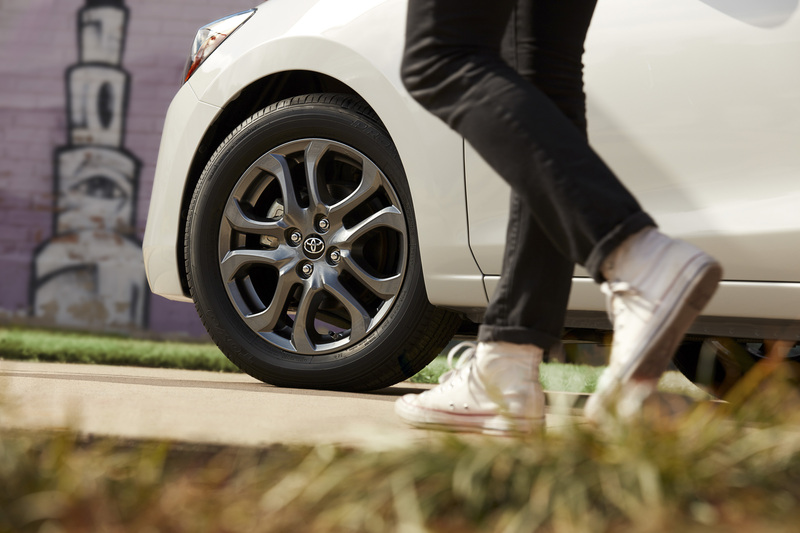 The LE and XLE feature a unique 16-inch alloy wheel with new dark gunmetal finish. 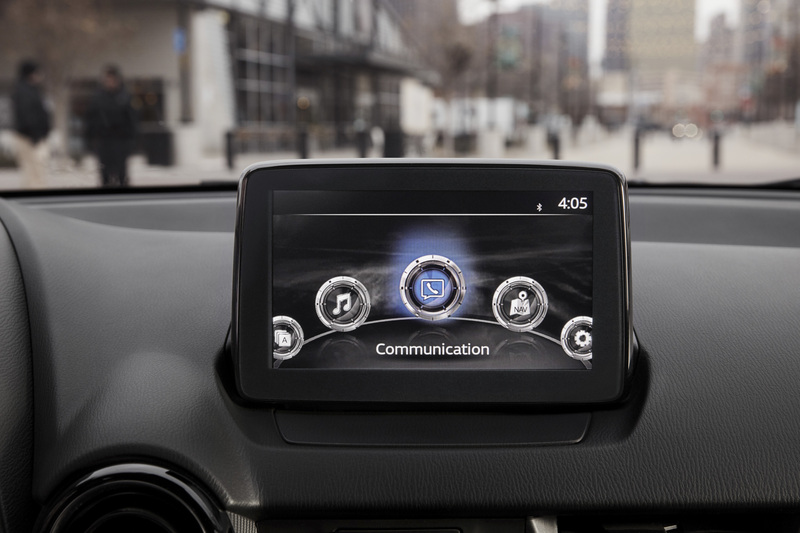 Upping the ante on interior comfort and features, every Yaris features a 7.0-inch touchscreen multimedia system with voice recognition, remote interface, steering wheel controls and Bluetooth connectivity. The touchscreen also displays the standard backup camera. 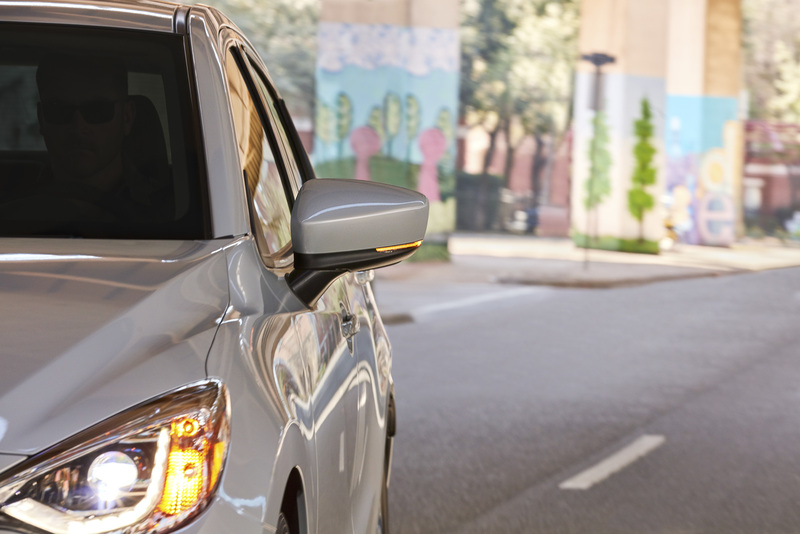 Belting out tunes in the cabin is a six-speaker sound system, and each Yaris includes available satellite radio with a 3-month complimentary SiriusXM® All Access trial. An integrated AM/FM antenna, auxiliary audio jack and USB port with iPod® connectivity are standard. Every Yaris comes equipped with a stylish instrumentation cluster that includes an analog speedometer, digital tachometer and incorporated trip meter. Cruise control also comes standard. Push button start is standard on all grades, and the L grade features a remote keyless entry system while both the LE and XLE are equipped with Smart Key System. Every Yaris is fitted with power windows with driver-side auto up/down and jam protection. 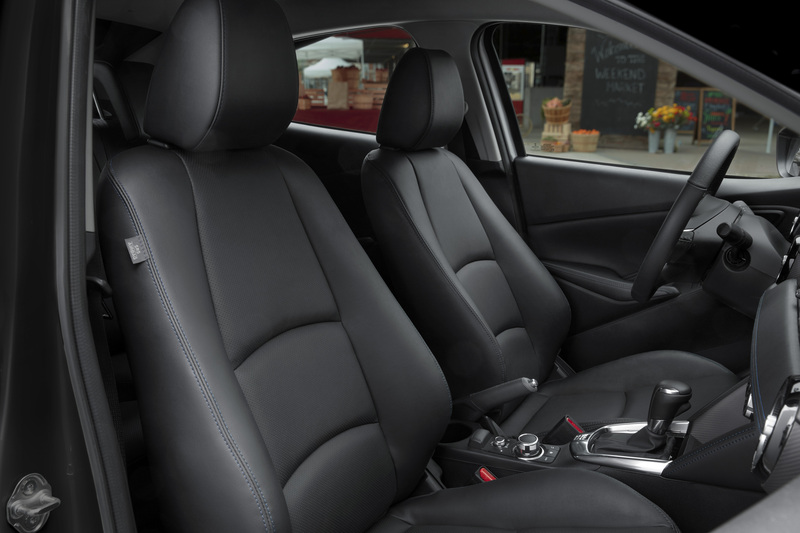 A standard 60/40-split rear seat easily expands carrying capacity and versatility. 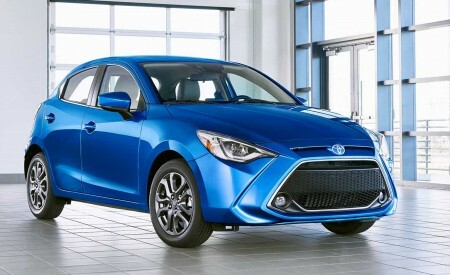 Every Yaris is equipped with an Active Safety System that includes Dynamic Stability Control (DSC), Traction Control System (TCS), Brake Assist (BA), Electronic Brake-Force Distribution (EBD), Anti-Lock Brake System (ABS) and a Brake Over-Ride System (BOS). The Yaris is also fitted with a Low-Speed Pre-Collision System, which scans the road ahead for potential vehicle collisions. If the system detects a potential frontal collision, an audio/visual alert and braking assistance are designed to automatically activate. Should the driver not respond, this system may automatically apply the brakes. A driver and front passenger airbag system and seat-mounted side airbags are standard, as are front and rear side curtain airbags. Other standard safety features include a Driver-side Emergency Locking Retractor (ELR) and Automatic/Emergency Locking Retractor (ALR/ELR) on all passenger belts. Lower Anchors and Tethers for Children (LATCH) is also standard on outboard rear seats with tethers and anchors on all rear seats. 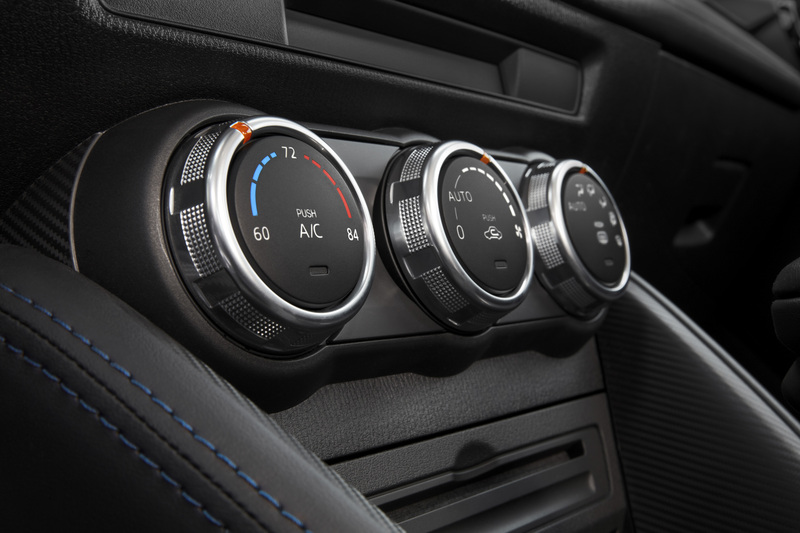 A Tire Pressure Monitor System (TPMS) also is equipped on all grades.